A fantastic storage solution that will compliment and blend into the natural surroundings of your garden whilst protecting your outdoor equipment and items, all whilst being maintenance free. 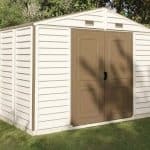 This shed could be the right option for you and your family’s needs if you are looking for a long-term solution to your outdoor storage issues. 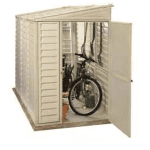 This is ideal for most garden spaces as it has good storage inside without being imposing. Constructed in a sand coloured durable resin and trimmed in chocolate, it is UV resistant, weatherproof and built to last for years, being completely maintenance free. This style has a reinforced shingle style roof and floor so it is extra strong and the large double, lockable doors allow ease of access to your products. All gardening equipment that is stored in the Suncast Adlington will remain clean and dry. This is easy to assemble with minimum effort and a handsome, small storage solution which works just as well as a secondary building slotting in well to any garden. If you are searching for a practical solution to your outdoor storage issues then the Suncast Adlington could be the shed for you. Practicality, quality design and style make this shed a fantastic option for you and your family’s needs. 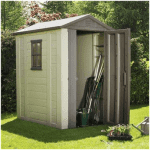 We understand that when you are looking for a shed to buy for your garden, there are many things to consider and many sheds to choose from. Below we discuss any features that you may be interested in finding out more about before making any purchase decision. 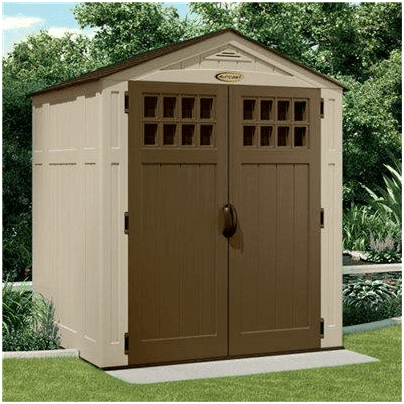 Colour: In warm sand and chocolate tones, this shed brings a subtle touch of colour to your garden whilst complimenting its natural surroundings. Doors: The strong double doors have small panes at the top to allow light into the shed, whilst the chunky handles make the doors easy to open. Once opened, the doors open fully to allow you full accessibility to your belongings, making everything easy to reach. Interior space: This shed comprises of a medium sized space, suitable for an average households outdoor equipment, tools and toys. With plenty of space, you may wish to add your own interior storage solutions for smaller items such as tools and the like. What can I store in it? 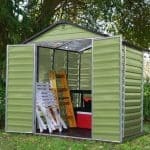 You can use this shed to store all of your outdoors equipment, garden furniture and toys when not in use, and of course tools. With plenty of space for all of your bits and pieces, you will find the exterior of your property looks neat and tidy once again. How secure is it? The strong plastic ensures that this shed remains secure and weather resistant at all times, protecting your items from outside conditions. Whilst the shed does not come with any security features, you are able to add your own padlock or other security accessories depending on your particular requirements. The Billyoh Adlington Four Plastic Shed: How easy to build? This shed comes complete with full instructions and easy-to-follow diagrams for easy assembly within a couple of hours. As per the manufacturer’s recommendations, it is recommended that two people assemble this shed together as the pieces may be heavy or too large size-wise for one person to handle by themselves. With a basic set of tools, we expect that even the most DIY-nervous of people could have this shed put together within a couple of hours. By which time you will be excitedly planning which of your items are going to go where within your shed. 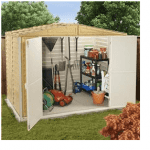 The Billyoh Adlington Four Plastic Shed: What is the overall quality like? If you are looking for a storage solution for your items that requires no maintenance whilst protecting your items from the elements, then the BillyOh Suncast Adlington shed could be just what you are looking for. Every detail has been considered by the team at BillyOh to provide you with a superbly designed shed that meets all of your needs. 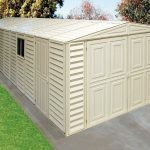 Constructed using UV resistant poly resin and complete with a reinforced floor to give you a place to store your heavier items, this shed is solid and built to last. Maintenance free, due to the plastic nature of the materials used to construct this shed, it couldn’t be easier to clean, just a quick hose down with water or spot clean with a soft sponge will get it back to looking its best in an instant. We see this shed as great value for money as it will stand the test of time, never needing any repairs due to the solid nature of the plastic used in construction. This smart looking garden shed could be the answer to all of your outdoor storage issues. Medium-sized with a spacious interior and easy access through the wide double doors, this is the perfect size for an average household’s outdoor equipment and other items. Although this shed sits at the higher end of the price point for similar sized sheds, we feel that is still proves good value for money as it is truly built to last for years to come.